The most important media story for us over the past week was the publication in Seeking Truth of the full text of President Xi Jinping’s recent speech to a collective study session of the Politburo on “media convergence.” We’ll have more to say about this text in the coming days, but it should be seen as a crucial statement on how the Chinese Communist Party intends to leverage new developments in media and information technology to further consolidate control over society. We offered a bit of analysis in late January of the language, as we could glimpse it from state media reports, coming out of the collective study session. As the news came last week that Hu Haifeng, the son of former Chinese President Hu Jintao, has been promoted to the top Party post in the city of Xi’an, readers may be interested to note the ways the Chinese media played down his appearance at the National People’s Congress — as a member of the provincial delegation of Zhejiang, where he has been serving as the party secretary of the city of Lishui. In the midst of China’s annual “two meetings” of the National People’s Congress (NPC) and Chinese People’s Political Consultative Conference (CPPCC), the parent of a student in the primary school division of the Chengdu No. 7 Experimental Middle School posted a photo to social media raising concerns about the possible use of spoiled food in the school canteen. 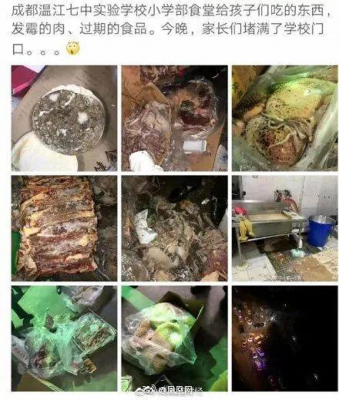 The photo suggested that the school was serving rotten and dangerous meat products and spoiled frozen food products, and vegetables such as potatoes and ginger that were also of questionable quality and safety. The parent alleged that substandard food was the cause of health problems suffered by some students, including diarrhea and bloody stools. 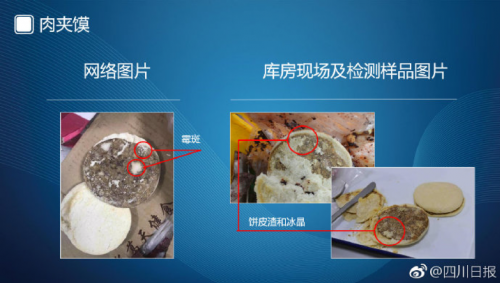 Soon parents posted other photographs of food reportedly taken at the school’s canteen, which showed mold growing on slabs of meat. Images posted online by school parents claiming to show rotten food in the school canteen. On March 13, parents from the Chengdu No. 7 Experimental Middle School gathered outside the school gates in Chengdu to protest the lack of food safety. The protests moved on to local government offices, and video posted to social media showed protesters being met with police and sprayed with tear gas. The use of tear gas was confirmed by as post made by police from Chengdu’s Wenjiang District (温江区) to their official Weibo account: “In the process, a minimal amount of tear gas was used against certain persons who seriously inhibited the work of law enforcement,” the post said. Soon after the protests, the Chengdu government announced that it had established a “joint investigative task force” (联合调查组) to look into the accusations against the school. Finally, at a press conference on March 17, a Chengdu police spokesman said that it had been discovered upon review of video cameras in the school’s kitchen that they had had reason to suspect that certain people had entered the canteen’s kitchen and fabricated images of food like those shared online. The spokesperson said that further investigation had revealed that three people, parents of students at the school, had forced their way into the school at around 10PM on March 12 and had ripped open packages of food and damaged it with the intention of making photographs and video to post online. Police said the three were now under investigation for “picking quarrels and provoking trouble” (寻衅滋事罪) — this being a charge frequently leveled at those engaged in acts of protest. A social media account operated by the official Sichuan Daily shows image comparisons purporting to expose faked online images of substandard food at the Chengdu school. Chengdu authorities also announced at the press conference that the school’s principal, Jiang Hong (江宏), had been dismissed for inadequate management and lack of responsibility. 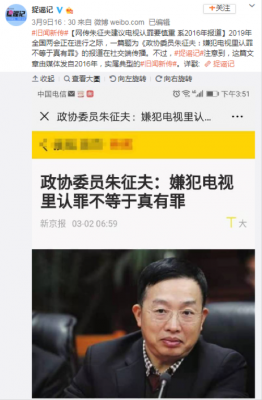 On March 9, “Rumor Grabbing Chronicles” (捉谣记), an account on Sina Weibo devoted to the busting of rumors, made a post saying that in the midst of the “two meetings” an article called “CPPCC Delegate Zhu Zhengfu: Confessions of Criminal Suspects on Television Are Not True Confessions” (政协委员朱征夫：嫌犯电视里认罪不等于真有罪) that had made the rounds on social media was in fact an article from 2016 — and so was a classic case of “old news making the rounds again” (旧闻新传). The old article on televised confessions was apparently of fresh interest to users of Chinese social media due to the recent televised “confession” of Supreme People’s Court judge Wang Linqing (王林清), who was accused by authorities of secreting documents in a high-profile company dispute after first being named as the whistleblower in the case. Many Chinese still suspect there is more to Wang’s case than the authorities are letting on. The latest edition of the official Seeking Truth (求是) journal, published on March 16, includes an article called “Accelerating the Development of Media Convergence, Building a Full-Media Broadcasting Structure” (加快推动媒体融合发展 构建全媒体传播格局). The piece is attributed to Xi Jinping. 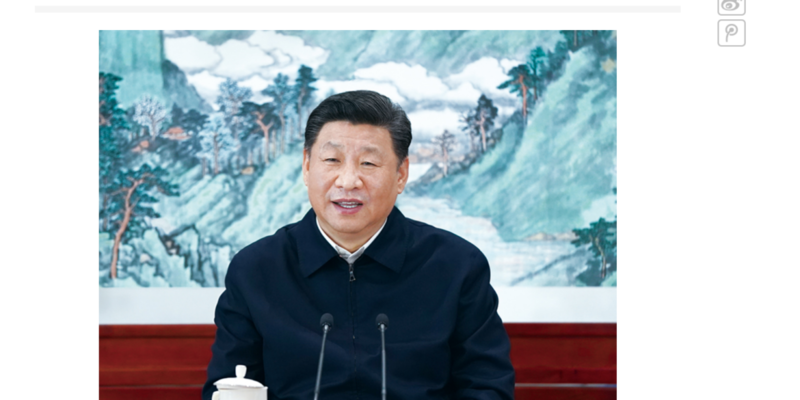 The Seeking Truth text is in fact a full-text version of a speech President Xi Jinping delivered on January 25 to the 12th Collective Study Session of the Politburo. In the speech, Xi Jinping says: “Our promotion of the development of media convergence is about building and strengthening mainstream public opinion, consolidating the common theoretical foundation for the united struggle of the entire Party and the people of the entire country.” His reference to “mainstream public opinion” is an unambiguous reference in Chinese to public opinion as it is manufactured and controlled under the leadership of the Party, particularly through Party and state-run media. 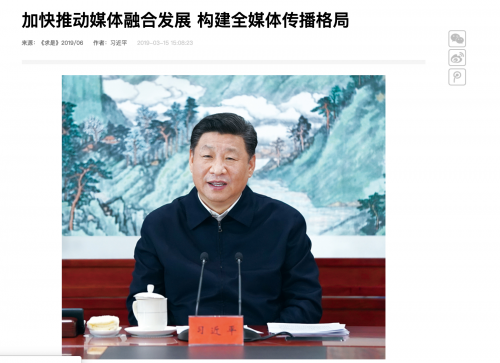 An article published on the website of Seeking Truth journal bears the byline “Author: Xi Jinping.” This is the full text of Xi’s speech on media convergence. Xi Jinping also emphasizes: “The development of media convergence is not just a matter for news units, [but we] must transform the social, ideological and cultural public resources, social management big data and policy making authority in our grasp into comprehensive advantages in consolidating and strengthening mainstream public opinion.” This language is the latest and clearest indication that the Chinese Communist Party aims to leverage changes in the nature of information technology to achieve greater social and political control over the Chinese population. Hu Haifeng (胡海峰), son of Xi Jinping’s predecessor as president and general secretary, Hu Jintao (胡锦涛), attended this year’s session of the National People’s Congress as a member of the official delegation from Zhejiang province, where he has been serving as the Party Secretary of the city of Lishui since July last year. Though Hu is a natural source of interest and public speculation as son of a former top leader who was recently promoted to vice-ministerial rank as the new party secretary of the city of Xi’an, the Chinese news media treated him very cautiously, with coverage understated even in Zhejiang. Zhejiang Daily (浙江日报), the official Party mouthpiece of Zhejiang, and its commercial spin-off, Qianjiang Evening Post (钱江晚报), published the same article on March 6 bearing the headline: “Zhejiang Delegation Deliberates Government Work Report, Wang Zhen gives Speech, Che Jun and Yuan Jiajun Attend” (浙江代表团审议政府工作报告 王晨讲话 车俊袁家军出席). Che Jun (车俊) is the party secretary of Zhejiang province, and Yuan Jiajun (袁家军) is the current governor and deputy secretary. 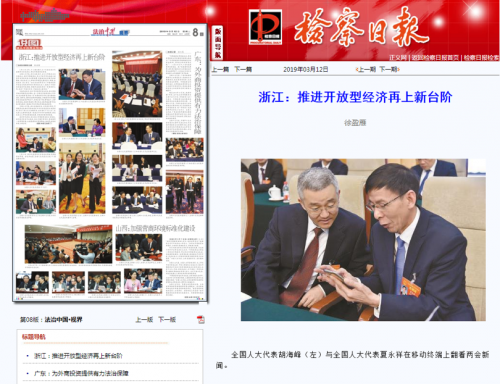 The Procuratorate Daily (检察日报), a newspaper published by the Supreme People’s Procuratorate, published a report on March 12 that included a picture of the Zhejiang delegation, Hu Haifeng included. On March 14, Guangming Online, the site operated by the official Guangming Daily newspaper, reposted an article from the Zhejiang’s official provincial news app that reported on the Zhejiang delegation and identified Hu Haifeng as the “Lishui Party Secretary Hu Haifeng” in the context of a discussion of environmental policies.